Tottenham striker Harry Kane says the team must "step up" when the pressure is on if they are to start winning trophies. Spurs' Premier League title challenge has faded after back-to-back defeats by Burnley and Chelsea, before Saturday's draw against Arsenal. Mauricio Pochettino's side are in third place, 10 points behind leaders Manchester City with nine games left. "We need to find a way to get it done," said England captain Kane, 25. "That is the turning point that we need to try to achieve." Tottenham go into the second leg of their last-16 Champions League tie at German side Borussia Dortmund on Tuesday with a 3-0 lead. The north London club posted a message on social media on Monday which read: "To Dortmund to get the job done". Will it take five years to change Spurs mentality? Tottenham, who have not won a trophy since claiming the League Cup in 2008, have challenged for honours under Pochettino in recent years only to fall short at crucial moments. They missed out in the race for the Premier League to Leicester City in 2016, with the Foxes finally securing the title when Spurs let a two-goal lead slip to draw at Chelsea in May. They were also beaten in the semi-finals of the 2017 and 2018 FA Cup, as well as in the last four of this season's Carabao Cup. Spurs, who finished third behind Manchester City and Manchester United last term, went into this season without making a signing, and also did not add to their squad in the January transfer window. Following the defeat by Burnley on 23 February, Pochettino - who took over at Spurs in 2014 - said it could take five to 10 years to instil the mentality in his side to challenge for the title. Kane said: "I don't think it's far away but I think what the gaffer was saying was it's not a guarantee that if you improve you are still going to win things. "Every team is improving, every team is strengthening, every team is getting better year by year - so it's important for us that we don't fall behind that. "We have got to a stage in the past four or five years where we have maybe done more than we expected as a club, but it means that we have to do even more to reach that stage. Two Spurs players are in - but who else makes Garth's team of the week? How do you think top six will look in May? 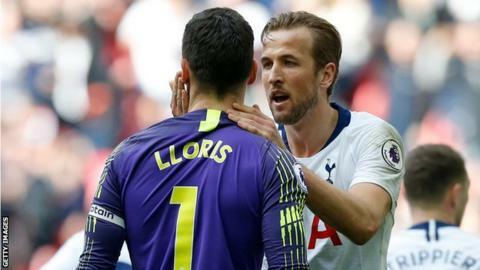 Tottenham were trailing Arsenal at half-time before a Kane penalty rescued a point for them and prevented three defeats in a row, though they still had to rely on keeper Hugo Lloris saving a last-minute Gunners spot-kick. "The manager said some things at half-time and that was the turning point because he is usually really calm and collected," said Spurs left-back Danny Rose. "He normally talks to us at half-time and this time it was like he was really sending us to war. "That was one of the best things I have witnessed in football, his half-time team talk, and we kept going and that was the attitude he wanted to see in the second half."